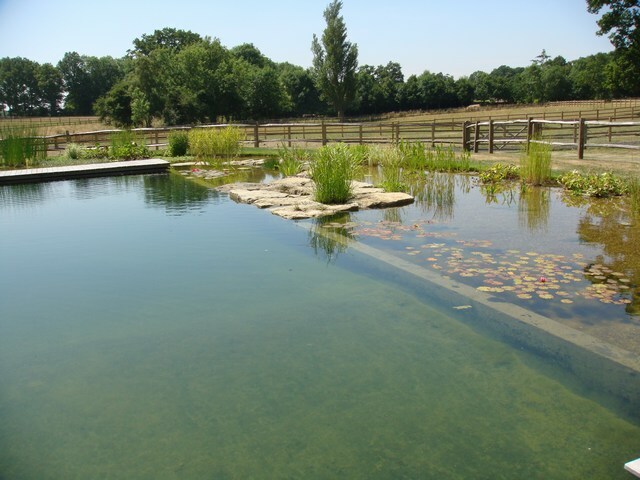 Design notes: Anglo Swimming Ponds are proud to have been chosen to assist in the Old Manor House project, by constructing the moat and pond in order to create a natural swimming pool. 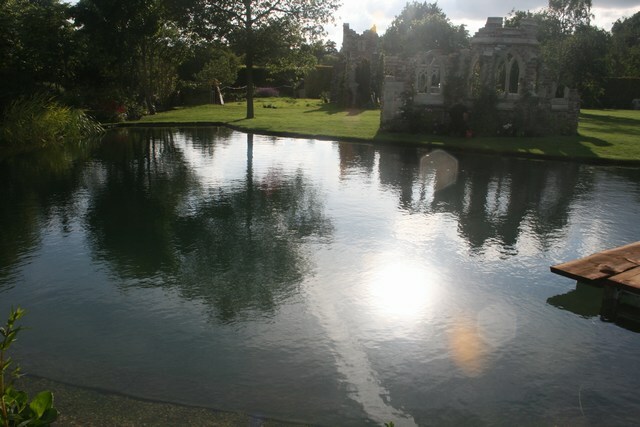 Primarily, the moat has been planted to act as the regeneration area and the swimming area was to recreate an old pond within the moat. Special features include the underwater steps leading in an out of the pond. They are made from recycled timber and plastic in the form of old oak beams. A small deck area, which in the past would have been used for fishing, acts as a diving platform into the deep water. 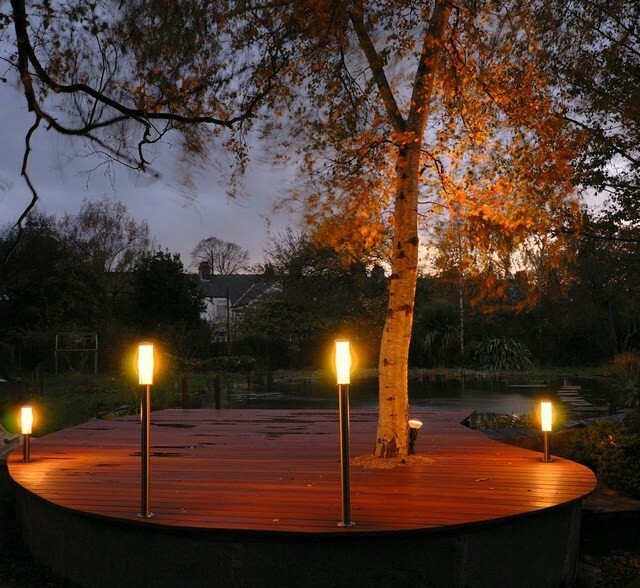 This has been constructed from natural sawn pressure treated softwood. 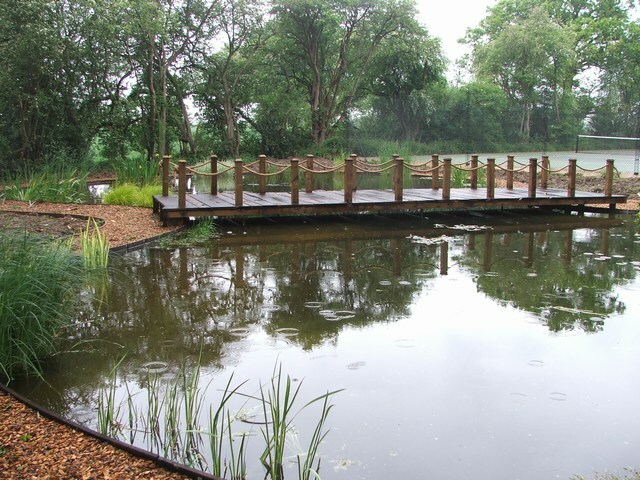 At the far end of the moat, a bog garden has been created for educational purposes as, until now, there has not been a moisture loving plant area at Capel. 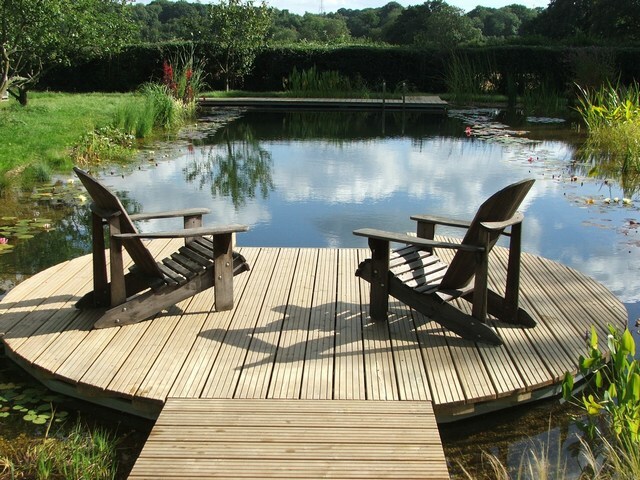 Design notes: This is a conversion from a swimming pool to a swimming pond. The original pool was built by the previous owner of the house, but unfortunately it always leaked – even on its open evening!! The current owner was not happy and asked us to come up with a green alternative. The original concrete shape closely resembled a heart and we used one side for the swimming area and the other for the regeneration area. 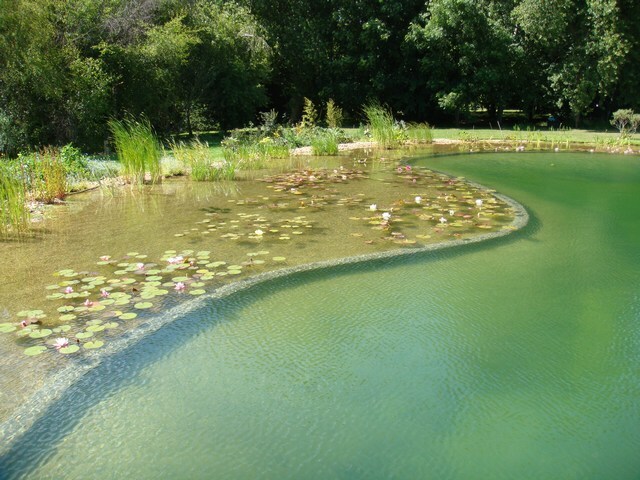 Once lined, the leakage problem was resolved and with the addition of some decking, filtration and filtration plants, it has been converted into a beautiful looking swimming pond. Design notes: The old school had already been converted into a house and only had a relatively small front garden which sloped down to the road. Our designers built walls and beds to “level” the site and the swimming pond covered most of the garden leaving a small area for some lawn. The design incorporated a deck and gazebo leaving enough room to enjoy a swim. 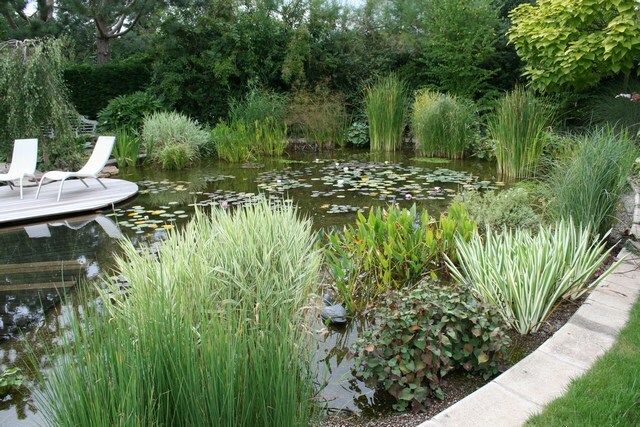 Design notes: This pond was designed by Michael Littlewood. We carried out the excavation, lining, filtration and planting. The client had his own input as he had some large rocks which he wanted to utilise as stepping stones and a diving platform and this arrangement was his own design. Sitting on the deck, one has a spectacular view over three counties, Wiltshire, Dorset and Hampshire. Design notes: Our client owned an orchard bordering the rear garden of his premises. We removed a few trees from the top of the orchard to enable us to carry out the necessary excavations. There is an Indian sandstone patio at one end with wooden decking at the other. 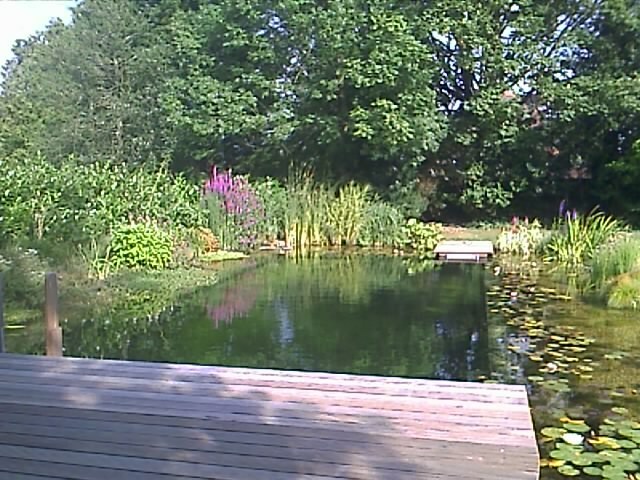 The pond has some steps from the patio and the wooden decking. There is a flight of sleeper steps in the lawn leading down from an area just below the house. 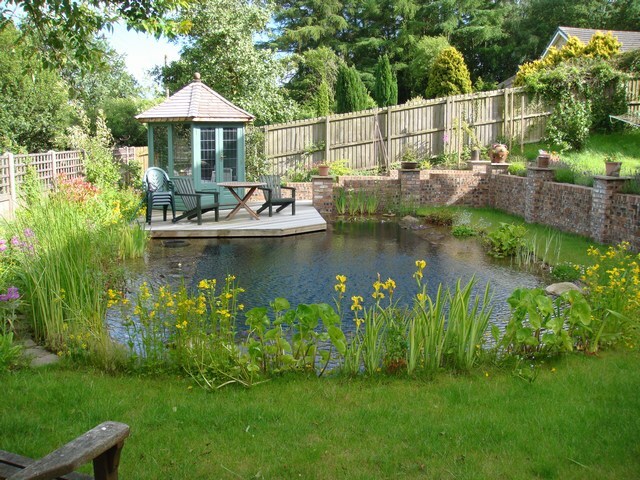 Design notes: This client wanted the swimming pond mainly for his grandchildren. He added a gazebo with kitchen facilities and had hand rails on the decking to reduce the risk of any of the young ones falling in. There is a waterfall at one end to add a dimension to the project. 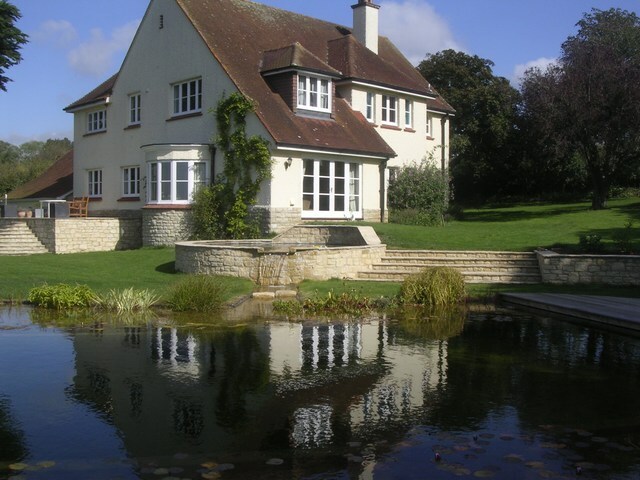 Design notes: Our client was a garden designer and when she came to us, she already had some provisional plans. After discussions, some amendments were made and a final plan was agreed. 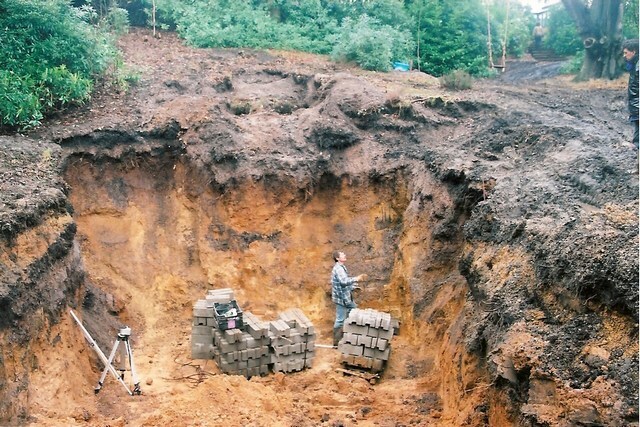 She already had contractors on site who carried out the excavation work before we moved in to line the pond and carry out the filtration and planting processes. There is a rather nice Breeze House, Sauna and hot tub to enhance their enjoyment. Design notes: This client leads a very exacting life and loves to come home and have an evening swim. She too has incorporated a hot tub in her design. As there was a wendy house in the garden that she wished to retain, this was moved during excavation ready to be sited near the waters’ edge on completion. Design notes: Already owning a beautiful indoor pool in the basement of the property for the purpose of her business, this client wanted a small outside swimming pond for use in the summer. Most of the excavation, construction and landscaping was completed by the clients and we carried out the lining, filtration and planting to complete the project. Design notes: With young children running around, this client decided to fence the entire swimming pond area, although we have since returned to remove the fence now the children are older. They wanted a stream from the top of the garden to run into the pond so we installed a pump to keep the water running from the end of the swimming pond to the top of the stream. Design notes: Another client who carried out his own excavation and construction, this pond has a beautiful barn right beside it. His children and friends could not quite wait for us to complete this pond before taking great delight in climbing on the roof and jumping into the swimming pond. 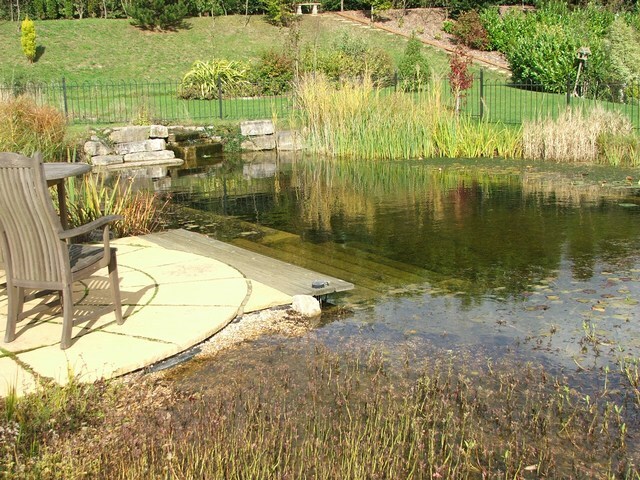 Design notes: Our client had already started excavating a pond, when his wife, who is a keen swimmer, read about swimming ponds. You’ve guessed it!! He dug a bit deeper and after we had lined it and completed the filtration and planting, his wife is very happy as she no longer has to go to the municipal swimming pool!! 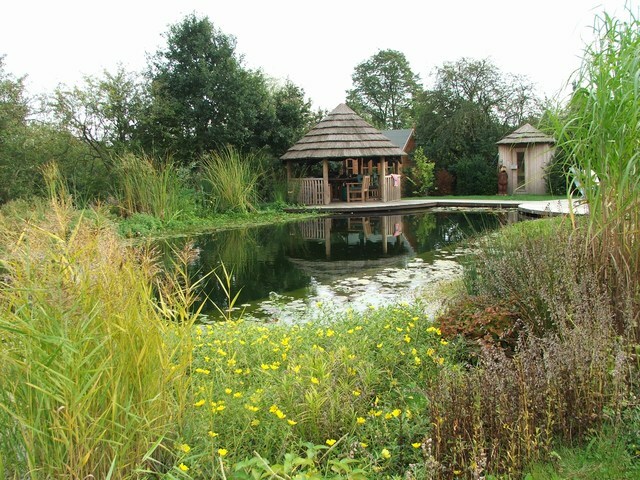 Design notes: Another own build client, this pond belongs to Bill Marsden, a keen photographer who took the pictures shown here. He also installed a considerable amount of lighting during the construction. 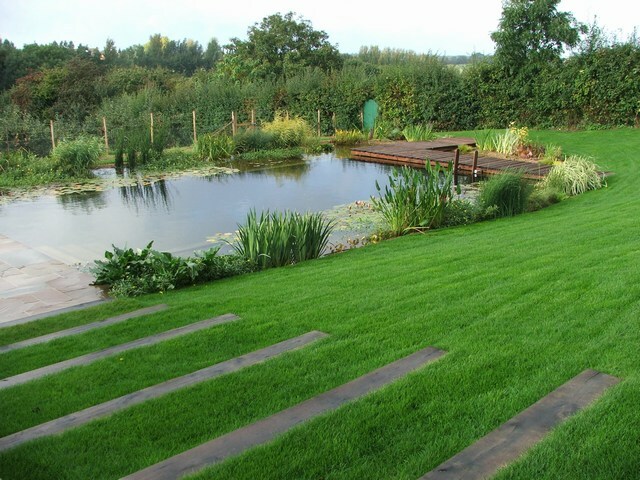 Design notes: Our client had a completely new garden to enhance the house and he decided to add a swimming pond. This was at the rear of the garden and in close proximity to an existing duck pond. 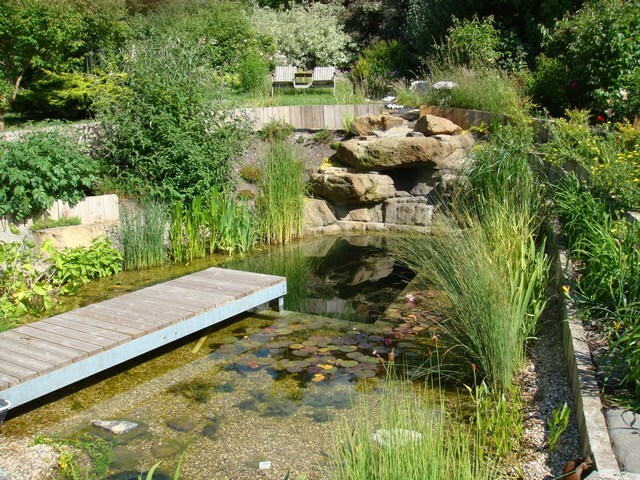 Design notes: One of our smaller ponds, this was incorporated into an overall garden plan and the excavations were carried out by the client’s own landscaping team. 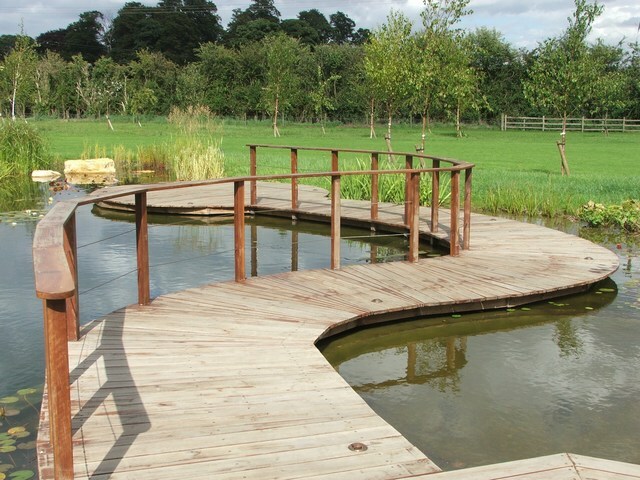 Design notes: One of our more difficult projects as the pond has been constructed on a fairly steep slope. Although the waterfall looks as if it is constructed from natural stone, it is in fact artificial and was constructed by a specialist contractor.